Customize any unit with your choice of two wood finishes. Crystal clear plastic front panel provides a full view of materials in each pocket. Pre-drilled holes, screws and anchors included for easy mounting. Decorative screw covers to match masonite backing are included. 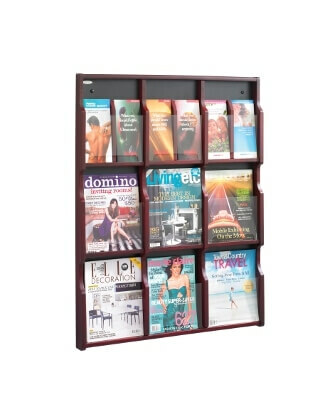 Removable dividers allow you to use each compartment to display a magazine or two pamphlets. Spark a natural instinct with exposure.